By the looks of it, it’s going to be a great holiday season! 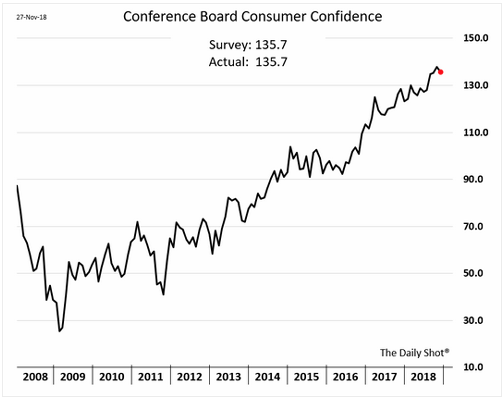 Consumer confidence is through the roof, and retail sales are surging. As a result, I expect to see lots of presents under my tree this Christmas. No coal for me; I’ve been a good boy. 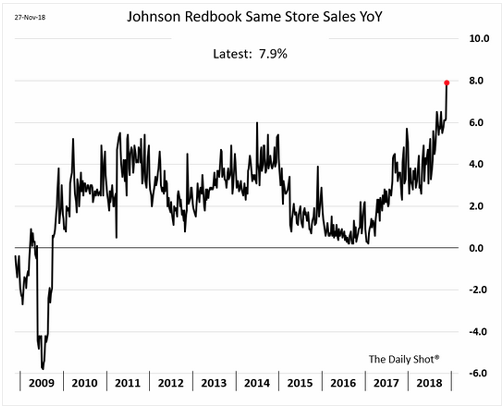 Before we dive into my concerns about retail stocks, let’s have a look at where we are. Yes, financial crises do happen! The last one was about 10 years ago. We investors often have short memories. Back then, consumer confidence plummeted right to the lows of the stock market in early 2009. That’s proved to be the buying opportunity of a lifetime! I mean, how much worse could things get? People were leaving the keys to their houses in the mailboxes out front and ditching their cars on the sides of roads. Today, confidence has surged. It’s more than quadrupled. As you can see, retail sales bottomed along with consumer confidence and the stock market. Since then, same-store sales have bounced around a lot. But, recently, they’ve surged to new highs. Now, everything is great. Sales are booming. Here’s my question: How much better can it get? The stock market’s starting to wonder the same thing. While everything is rosy for consumers, consumer stocks are starting to discount all of the enthusiasm. That’s what my look at the SPDR S&P Retail ETF (NYSE: XRT) revealed to me: lots of red flags. First, the index is trading below where it was more than three years ago. Second, it’s trading below key moving averages. It’s in a bear market. Third, as the index was moving higher, it was doing it on lower volume. Less and less demand was pushing the index higher. Finally, there’s a massive divergence in the relative strength of retail stocks and the index itself. This means that even though the index had been going up, it was losing momentum compared to the rest of the market. In other words, super-enthusiastic consumers and strong sales don’t translate into higher stock prices. In fact, the index is suggesting that these stocks have a lot lower to go. It’s already priced in. And stocks are beginning to reflect the reality that things can’t get much better from here. Originally published in The Rich Investor.